Custom Ink is a leading online custom printing service, based out of Fairfax, Virginia, United States. They focus on custom designed T-shirts and apparel, but also print other merchandise such as drinkware. One of their most lucrative markets are amateur sports teams from schools and other organizations, who order their kits and uniforms. Buy 10 or more, Get 1 Free. The privately held company was founded in the year 2000 by Marc Katz, Dave Christensen and Mike Driscoll. They wanted to streamline the process of custom apparel printing, which usually involved going to a local printer, paying an inflated price and waiting a long time for the finished product. The online concept was an immediate success and they have now grown to over 1,300 staff members, in 5 facilities across the country. The company makes over $200 million in yearly revenue. The three founders are still on board today, with Katz serving as CEO and Chairman. The company sells all sorts of customized t-shirts. What really makes ordering from the company such a fun venture is the design center available on the website. It allows customers to really create their own designs. You'll really get a good deal if you can use a Custom Ink voucher code also. If you represent a group or are trying to hold a special event, it can sometimes be difficult coming up with necessary funds. The website provides plenty of information on possible sponsorships that could help you. There may be companies willing to pitch in that you would otherwise know nothing about. If you're looking to raise your own money, then fundraising with the t-shirts that you've designed can be a great way to do so. Visitors will find fundraising tips available on the website that will really help out. Custom Ink offers thousands of base templates and designs, covering all sorts of themes, from its Templates page. These can then be customized with your own design elements, although you can also upload your own images. logos and designs completely from scratch. T-Shirts, Long Sleeved Tops, Vests & Tank Tops, Polo Shirts, Sweaters, Hoodies, Tracksuits & Zipups, Scrubs, Uniforms, Hats, Bags, Jackets, Button Shirts, and others. Sizes cater to Men, Women and Children. Accessories include Drink Bottles, Mugs & Glassware; Magnets, Frisbees, Umbrellas, Ornaments, Stickers, Towels, and more. Custom Ink also offer a number of related services, such as helping your team to get Sponsored by advertisers. There's a reason why there are plenty of positive Custom Ink reviews. Assistance is available for customers to get right on the website. You can simply chat with a live person who will be able to help out. Of course, you can always call into their customer service center for help when you need it for example with using Custom Ink coupons and discounts. It's a good idea to save as much money as you can when buying from CustomInk. A good way to do this is to check out Coupofy Coupons to see if there are any special offers on their updated list to suit your needs. 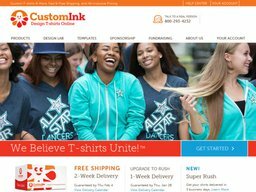 A simple search of the site will provide you with a list of links that will take you right to CustomInk.com where you'll be ready to save. Custom Ink accept orders online and over the phone, and you can pay using most major credit cards. These include American Express, Visa, Mastercard and Discover. You can also apply for a credit account if you represent a business or organization, so you can buy now and pay later. Fortunately, the process of redeeming a Custom Ink coupon is extremely simple. After you've finished designing your shirt or purchasing other merchandise, then simply hit the checkout page. On this page, customers will find the appropriate place to enter their Custom Ink discount code. Custom Ink currently only cater to customers in the US, offering several convenient shipping options. Standard Delivery will arrive within 14 days. Then there's One-Week Rush, and 3 Day Super Rush, if you need your order particularly fast. They use either UPS or USPS depending on which is fastest at the time. To calculate the cost of shipping you should add items to your basket, enter a delivery address and then choose the shipping method. Custom Ink operate a 15 day money-back guarantee, meaning you can get a full refund on your order if it arrives damaged, defective, or significantly different from what you expected. Due to the nature of customized goods you cannot return an item simply because you no longer want it, because the company will be unable to sell it again. To make a claim you must contact customer support within 15 days. @MeganADutta Thanks for the shout out! We're always happy to help. We'll be sure to pass along your compliments to Larissa. @spacerudeboi We didn't know we were THAT good at customer service.